Referring to Illustration Friday topic 'Wheel'. I decided I would follow up the cat and bird images, and see what happens. I used 'Dreamcatcher' to represent Wheel. I wanted the bird to be part of the dreamcatcher, whilst holding a heart from its mouth. 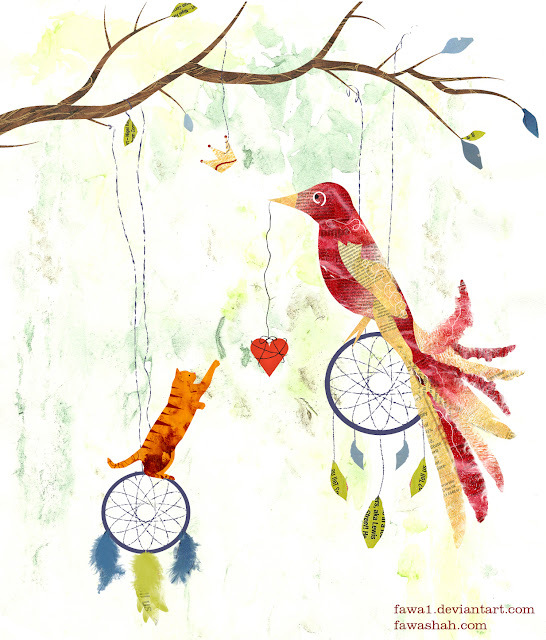 The cat is trying to catch its dream (love with the bird). Whereas the bird is trying to catch its dream (the crown). Hi Farah, Really like your illustration! The bird is beautiful and I like the technique you have used. This is a beautiful story, like a delicate love song. I love your textured style...did I say that already?! Hopefully I can continue the story on with Illustration Friday topics.